I can't believe how quickly the summer is passing by. The leaves are starting to change colour. I hate to say it but I have even had my flannel PJ's on a few nights when the temps have dipped. The garden is still producing tomatoes and we still have to harvest potatoes, squash and herbs but there is still lots of time to do that. I have been getting busy for a couple craft shows and doing a bit of painting and trying to tie loose ends up for a couple of swaps. Today I am going to show you a few things I have had done and some matchbox swaps and ATC's I have received. Nothing like getting fun mail, it's like Christmas at my house. Sometimes I set the box on the table and stare at it like I am waiting for the clock to turn to the actual correct time, not that any time is more or less correct, sometimes I can't wait to tear the box open, it all depends on how eager I am to rip it open. Most of the time I do just that and I am just dazzled lately at what the generous folks I have traded with have sent me. Here is a beautiful matchbox from Miss Peach who sent me this in the theme of " My Favourite Things" over at the FlickR group Monthly Matchbox swap. We were to find out our partner's favourite things then decorate and then fill her box with goodies she could use and like. 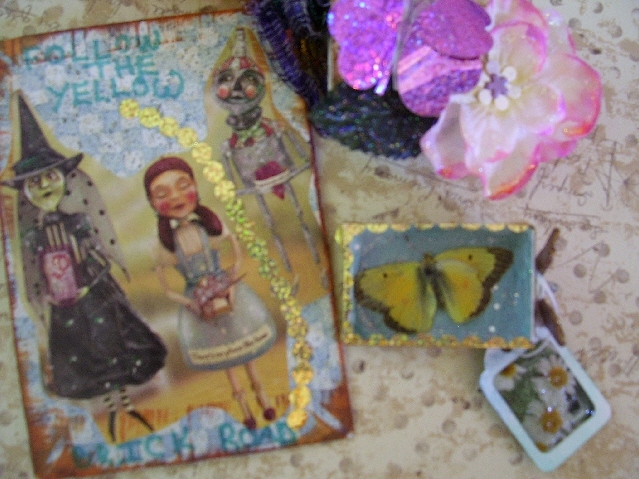 Miss Peach made me this wonderful Oz Cabinet Card as I truly love the Wizard of Oz. I could watch that movie over and over. I even have the tape here at home to watch whenever I please. Not sure hubs would care for it that often but it is I would say my favourite movie. And I also like butterflies so Miss Peach made this box and inside was this beauty encased. Miss Peach said this was stuck to a grill of a truck or car and it is preserved so perfectly. Now it has travelled all these miles to Canada and I will keep it here safe and sound. And look at all the goodies she sent me as well. Thanks Miss Peach. This next month I have her name so I will be posting a pic of her matchbox but the pic was blurry so I have to retake it . Next is a matchbox I got from JoScraps over at the Vintage Dragonfly's Grandma's Attic swap. 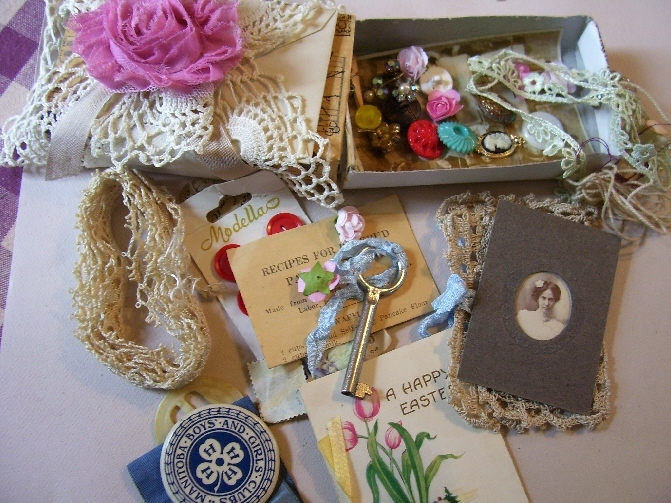 We were to make a vintage type of matchbox and use mostly vintage items. Jo certainly filled this box and then some. 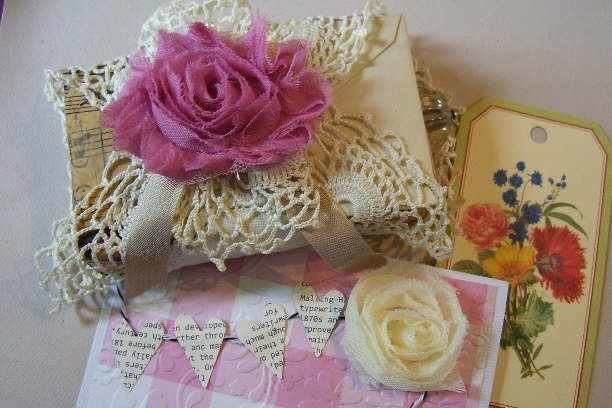 Take a look at the flowers, the card and all the goodies inside. Even the string is vintage. And I just love that beautiful antique image in the frame. Thanks so much Jo. I hope you feel better soon, sounds like you had a rough summer. Next are a couple Teacup themed ATC's I did a trade with Wendy from BlissAngels. We started this trade before the Canadian Postal strike so that delayed us sending back and forth. I did finally get these ATC's. Well after the postal strike and they seemed to have sat at the Customs Office for over a month. Now they are here for me to enjoy with Wendy's cute little fairy children sitting in their teacups. Thanks Wendy, they are wonderful. And finally here are my bird canvases I had mentioned a couple posts ago and a fairy canvas I just made for someone special. 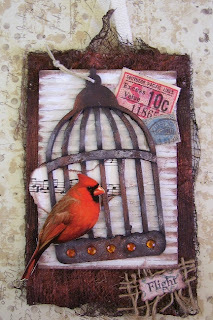 I used the TH birdcage die and embossed and painted to make them look old and worn. 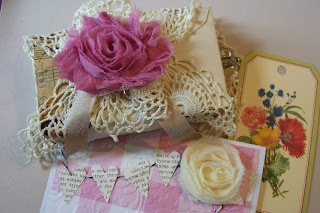 I have used a canvas on the back with layers of cheesecloth and lace. I painted them with burnt umber, black and metallic bronze paint slip slapped all over. I used corrugated cardboard with the top layer ripped off and then painted with antique white slip slapped for a worn look as well. The more rustic the better and I wanted to keep a nature theme going. I also used some burlap at the bottom corners underneath the words. 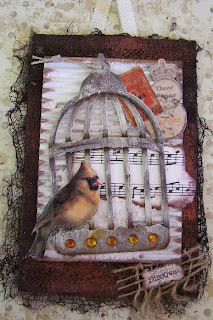 I had the birds from a card or something in my stash so I could finally use them. I think these would look nice in a sun room on the wall or even a bathroom if you have a nature theme going on. 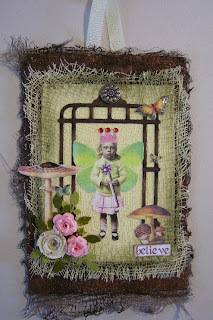 And here is the most recent canvas I created using another die cut birdcage but I cut it to make an arbor for this little fairy. The top piece on the canvas is chipboard painted with cheesecloth and antique white paint then I took a touch of Timberline green on the corner and just brushed it here and there around the edges just to add a bit of colour and going with a theme of nature again, green brown. the top of the arbor is a brad that I found in my stash with the prongs removed or just gone so it fit nicely there. I used some fungi images I believe are from the Graphics Fairy, some butterflies, roses I made and a rolled canvas flower I added some distress stickles to. All in all this turned out better than I expected and I hope that I will surprise one of my recent swap partners. Well that is it. I hope you haven't fallen asleep. I will try to post a bit more regular now. 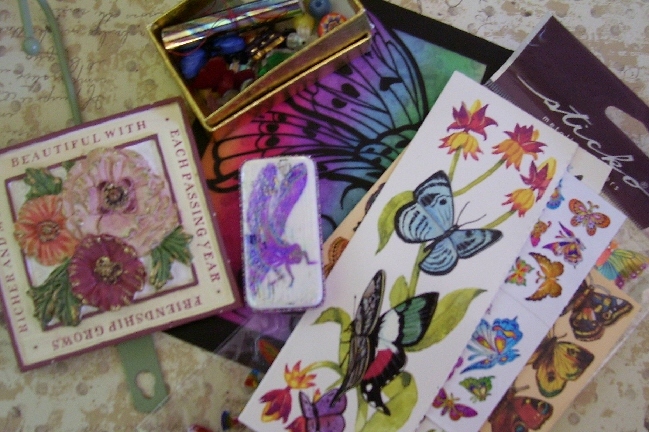 I won't be doing much swapping or paper crafts as I need to concentrate my efforts on painting for my craft shows. And....I am looking for glass glitter, clear so that I can use it on some paper painted ornaments for Christmas. If you have a resource you can share with me that is economical could you please comment or email me. I am looking for some but I know a lot of you peeps may have better resources than I do or can find. Nice to see your post this morning and all th e beautiful goodies. Those are some wonderful swap returns and I love your canvas with that birdcage die! Wow, you sure have been busy on those canvases. I really love the textures and layers you are using. Time for me to break the seal on my Sticky back canvas pack! Wow Leslie, so much to share today. 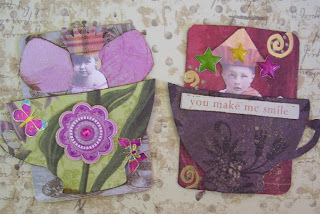 Wonderful match boxes from Miss Peach and Jo scraps, Wendys tea cup atcs are just adorable! and Love your bird cage canvases. not sure about clear glass glitter but I get my glass glitter here. Oh wow, those bird canvases are adorable!!! 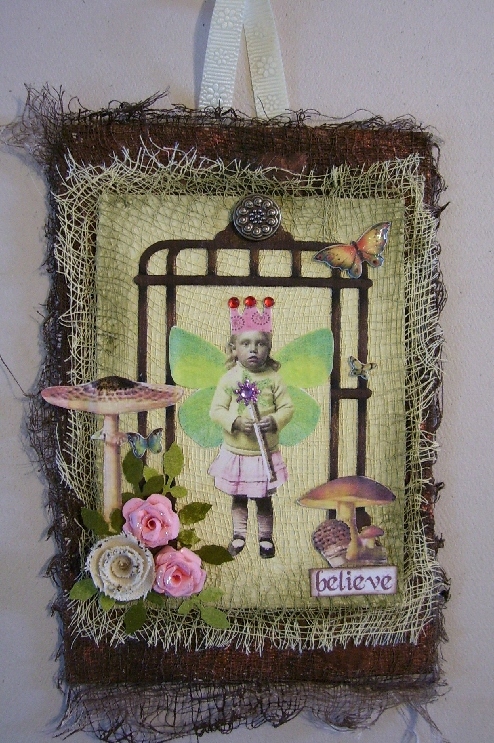 the faerie one rocks! what a clever use of a bird cage.